This otherworldly landscape of shifting sands has many secrets to uncover. 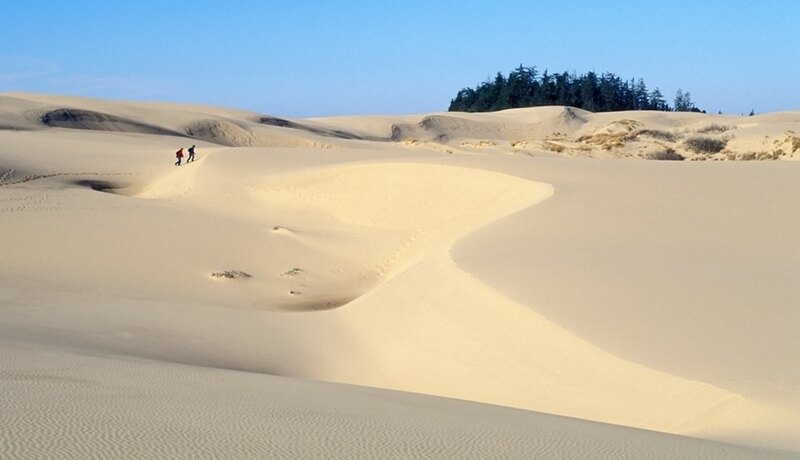 The next morning they saw the Oregon Dunes National Recreation Area by daylight, an otherworldly collision of forest, ocean and desert that stretches south about 40 miles from Florence to Coos Bay. That first glimpse was one reason Hoeh eventually moved here. One of those road-trip friends eventually became his wife, and together with their children, they love to explore the dunes, part of the Siuslaw National Forest. “It’s still my family’s favorite place to visit,” he says. The director of the Cape Perpetua Visitor Center, Hoeh happily shares his outdoor office with locals and visitors alike. Part of his job is running the Siuslaw’s field-ranger program. This has only deepened his knowledge of these ever-shifting sand mountains, which form the largest stretch of coastal sand dunes in the country. To see where the dunes came from, just look inland: They’re essentially ground-up pieces of the Oregon Coast Range, worn away by time and weather and washed downstream to the ocean. Tides, currents, waves and wind pushed the resulting sand back inland. Since this part of Oregon’s coastline is a gentle slope instead of the usual steep headlands, the sand spread inland as far as 2.5 miles. Over millions of years, it piled up to 500 feet above sea level in places, interspersed with marshes, isolated “tree islands” and lakes formed by sand-blocked rivers. It’s a thoroughly poetic and mysterious place — in fact, the seemingly endless massifs of sand inspired Frank Herbert’s science-fiction classic “Dune.” The dunes themselves seem to roll on endlessly, and even with as much time as Hoeh spends here, he still finds himself in awe of his home on the Coast. There are many ways to experience the varied terrain, but Hoeh’s preferred mode is by foot. He recommends visitors start at the Oregon Dunes Day Use Area, just south of Dunes City. “There’s a wonderful viewing platform looking south over the dune landscape and a short trail that leads out to the beach,” he says. “You can take a longer hiking loop around Tahkenitch Dunes.” This trailhead 2 miles south is popular with backpackers, with an 8-mile network and fresh water available in Tahkenitch Creek and Threemile Lake. The dunes foster a diverse ecosystem of life. Keep your eyes peeled to spot the many animals that live here. On the beach, keep an eye open for seabirds, sea lions and gray whales offshore. Inland is the province of bald eagles and osprey. 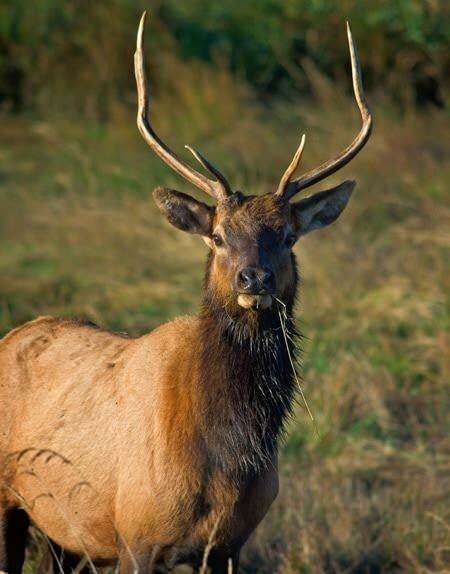 You might even spot a Roosevelt elk, Oregon’s second-largest land animal (after moose), grazing along the highway on its way to or from the Dean Creek Elk Viewing Area east of Reedsport. Other things that grow on the dunes aren’t as welcome — especially invasive species like European beach grass, originally planted to keep sand dunes in place. Now it threatens the existence of the dunes themselves by anchoring tall foredunes behind the beach, which keep sand from blowing inland. Volunteer groups, often organized by the Forest Service and the Oregon Shores Conservation Coalition, go out regularly to yank the tenacious grass and keep it under control. The small city of Reedsport along the lower Umpqua River is home to the Oregon Dunes Visitor Center, the place to check on any areas closed for nesting Western snowy plovers, a threatened species along the Coast, and to learn how the ever-changing winds shape the sand into wave-like transverse dunes, massive oblique dunes, C-shaped parabolic dunes and other shifting forms. South of Reedsport is where the dunes start to truly tower. “You’ll see the tallest and most impressive dunes at the John Dellenback area,” says Hoeh. The Umpqua Dunes area at Winchester Bay has some real monsters, as well as bizarre wind-carved sand formations called yardangs. Out here you also might hear the sound of off-road vehicles, since this is one of three places in the recreational area where they’re permitted. 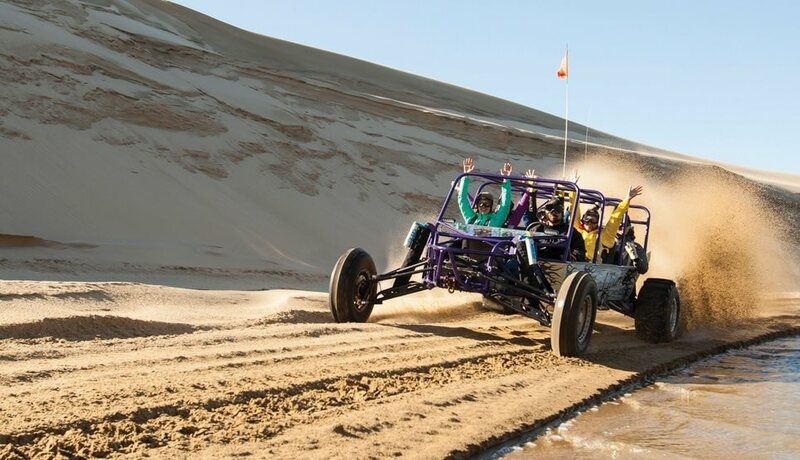 A high-speed tour in an ATV, dune buggy or lightweight sand rail (imagine a dune buggy’s metal skeleton on wheels) is a different and exciting way to see the place. “It’s a lot of fun,” he says. Companies such as Sandland Adventures in Florence and Spinreel in North Bend offer professional guided tours and buggy rentals. For winter months, Sand Dunes Frontier in Florence offers rides that will wake you out of hibernation. 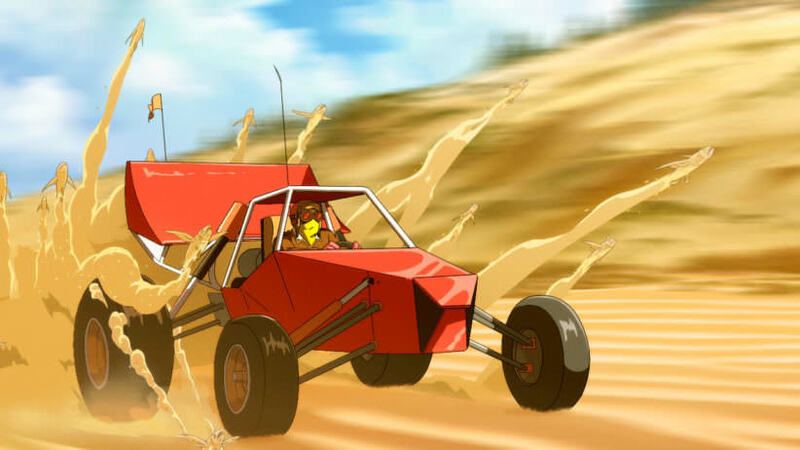 Another way to experience a mountain of sand is to slide down it — fast. “One of my favorite things to do is to go sandboarding in the dunes,” Hoeh says. Sand Master Park in Florence is the world’s first park dedicated to this oceanside cousin of snowboarding. You can rent boards and learn to carve turns on beginner and expert slopes. There are jumps and rails for nimble riders, as well as sandboarding festivals in mid-July and mid-August. There are also many ways to get out on the water too, Hoeh says. The Siltcoos River flows gently for 3 miles from a lake to the ocean, making it a paddler’s favorite. And while you might not expect an expanse of sand dunes to offer great fishing, the many lakes in and around the recreation area offer just that. Some are stocked with trout or bass, while Tahkenitch and Siltcoos lakes both see seasonal salmon runs. 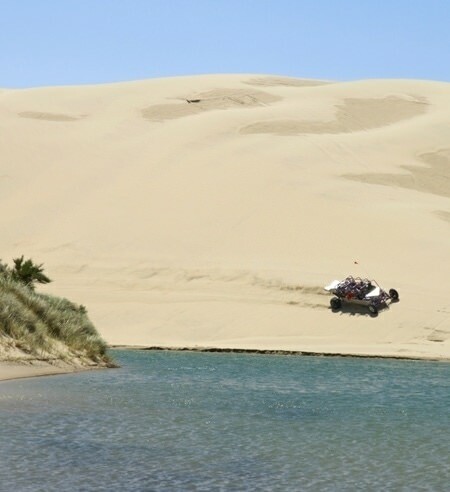 The Oregon Dunes National Recreation Area is one of the most awe-inspiring landscapes in the state, so visitors have a responsibility to take special care when visiting. Before setting out, make sure you have purchased any necessary Forest Service recreation passes. Whatever your adventure entails, from hiking to sandboarding, follow Leave No Trace principles, including packing in and out, leaving what you find where it’s at, and respecting wildlife and other visitors. During snowy plover nesting season, from March 15 to September 15, check for seasonal restrictions on activities at select beaches; by carefully observing the restrictions and sharing the beach, you’re helping protect these threatened birds. 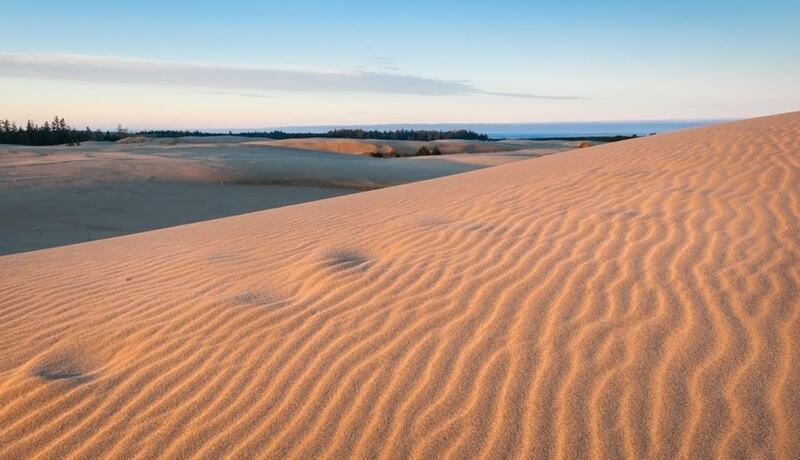 If you want to help preserve the Oregon Dunes, you can learn more about volunteer opportunities at SaveOregonDunes.org and the Forest Service’s volunteer page. Julian Smith writes about science, conservation, travel and many other things from his home base in Portland. 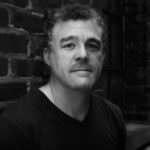 For more on his books, articles and photos, see his website www.juliansmith.com.